So, tiaras being one of my favourite subjects (ah! 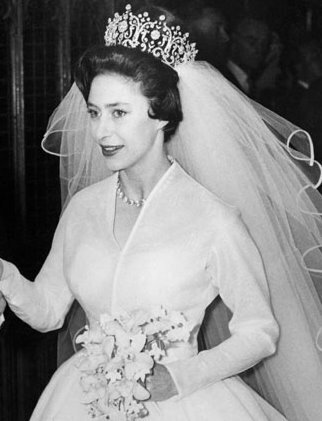 ), today we take a closer look at tiaras worn by British royal brides over the decades, beginning, with a slight historic inaccuracy, with Queen Elizabeth's Strathmore tiara, which wasn't worn exactly on her wedding day, but was indeed a wedding present, and it's a particular favourite of mine, I feel justified in adding it to this list! 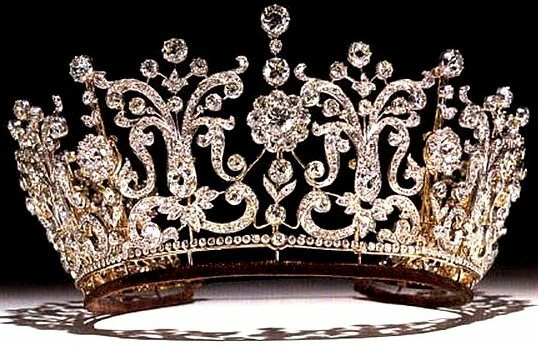 The highly informative The Queen's Diamonds book by Hugh Roberts, Surveyor Emeritus of The Queen's Works of Arts, reveals that the tiara is late nineteenth century and made up of pavé-set diamonds, mainly rose-cut in silver-gilt on a gold frame, that form a garland of wild roses. 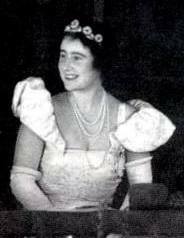 Technical details aside, the tiara was famously given to the then Lady Elizabeth Bowes-Lyon by her father, the Earl of Strathmore, on her marriage to the Duke of York (later King George VI) in 1923. 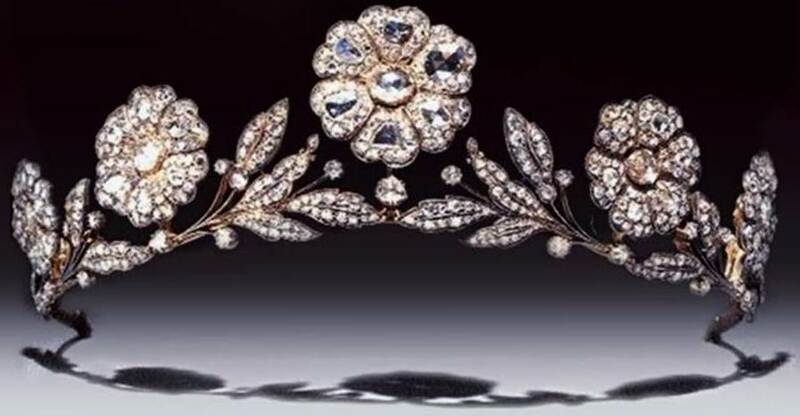 Hugh Roberts informs us that "the tiara was retailed by the jewellers Catchpole & Williams, of 510 Oxford Street, and was supplied with two alternative frames, one invisible (for wear as a bandeau over the brow), the other padded (for wear on the head). 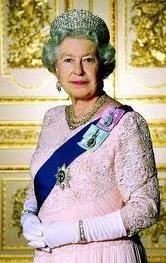 It could also be dismantled to form five individual brooches", which apparently could be substituted with single sapphires. 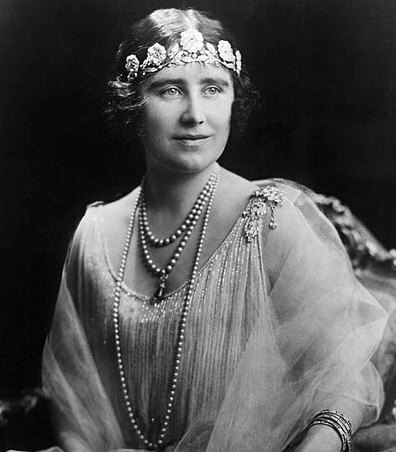 When Duchess of York, Queen Elizabeth was photographed a number of times wearing her tiara in the 1920s style, fashionably low over her forehead. 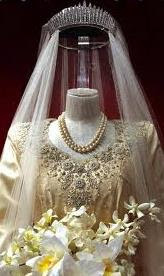 Although it was inherited by the Queen on the Queen Mother's death in 2002, this piece has not been worn since (nor, indeed, it had been worn in public for many decades since its early days). Fast forward a few years, and here comes Princess Elizabeth's wedding to Prince Philip in 1947. For her "something borrowed", the woman who was to become Queen in a matter of years choose Queen Mary's Fringe tiara, a 1919 piece by E. Wolff & Co. for Garrard & Co. The jewel was originally made especially for Queen Mary, in the Russian style which was especially fashionable at the time (Tsarina Alexandra had had a tiara in exactly the same style, reminiscent of the traditional Russian headdress kokoshnik). 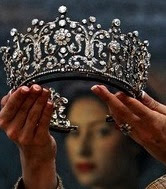 Hugh Roberts reports that in was given in 1936 b﻿y Queen Mary to Queen Elizabeth, from whom it was subsequently borrowed by Princess Elizabeth to be worn on her wedding day (and on a number of occasions since she inherited it from her mother in 2002, most famously in one of the Diamond Jubilee portraits). 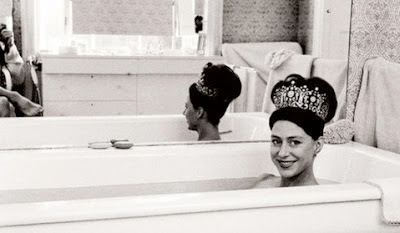 The it was Princess Margaret's turn, with her marriage to Anthony Armstrong-Jones in 1960. This time the bride choose the Poltimore tiara, a splendidly intricate piece made by Garrard & Co. in 1870 for Lady Poltimore. Princess Margaret bought it herself, at auction in 1949 for £ 5,500. Upon her death in 2002, it was auctioned again, together with other pieces in her collection, to help pay estate duties. 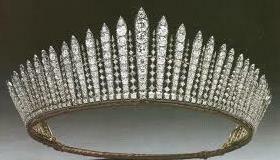 This time, the tiara sold for £ 926,400, against a top estimate of £ 200,000. The Princess was later famously photographed by her husband while wearing the tiara in the bathtub. 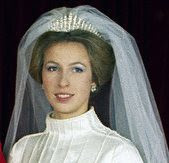 Then, on 14 November 1973, the Queen's daughter Princess Anne married her first husband, Captain Mark Phillips (it should be noted that for her second marriage, to Commander Timothy Lawrence, the Princess Royal opted not to wear a tiara, choosing instead to adorn her hair with a simple sprig of orange blossom, which matched her bouquet and complemented perfectly her cream suit). Anyway, back to 1973...Princess Anne chose a rather unusual, stunning white silk gown in the Elizabethan style, inspired by Tudor court dress (more on the dress itself can be found at The Royal Order of Sartorial Splendor). 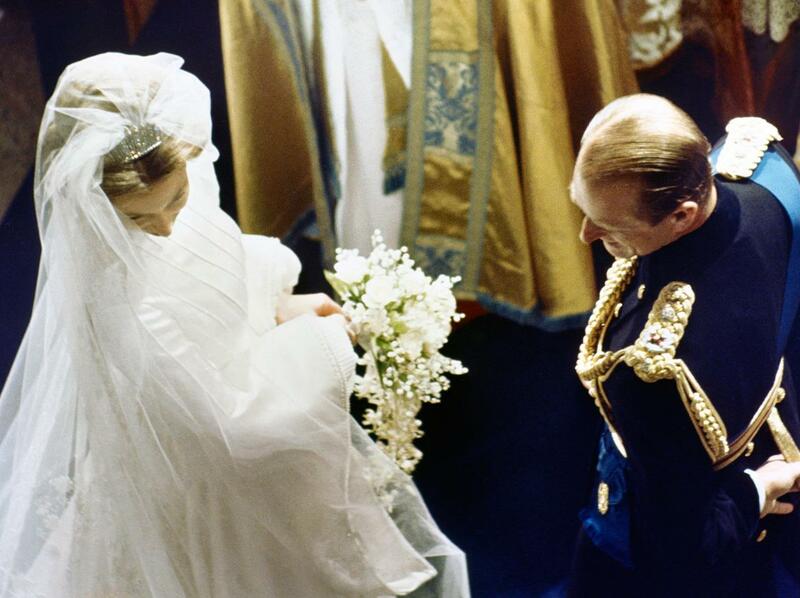 Nothing new on tiara side this time, though, as Princess Anne got married in Queen Mary's fringe tiara, the same piece her mother the Queen had chosen to wear to her own wedding 26 years earlier. I just couldn't resist adding this photo of the bride with her father the Duke of Edinburgh...so beautiful! Could she have chosen something else, ﻿perhaps something more delicate and prettier, in keeping with the fairy tale style of her wedding? She definitely should have, in my opinion...after all, she had a lot of other options to choose from in the extensive British royal family collection: her grandmother's Strathmore tiara would have been a spot on choice, given also its Rose of York motive, which would have complemented perfectly the Tudor theme of the wedding dress.